This is the 1st of 2 posts that are part of the Royalty on Film Blogathon being hosted by Emily over at The Flapper Dame. Thanks for letting me participate! Check out the rest of the entries here. Brief Synopsis – Biopic of Oliver Cromwell who led an open rebellion against the British Monarchy from Parliament in the 1600’s. My Take on it – This is a movie that I’ve been meaning to watch for a while and thanks to this blogathon finally got to see it. Being a history fan, I knew a bit about this period of British history, but not enough to not be enamoured by all as it unfolded before me. They do an excellent job here of showing the positive and negative aspects of having a country run by a monarch (dictator) or democracy (Parliament); sometimes things work well and sometimes they don’t and there isn’t much difference because neither is perfect. 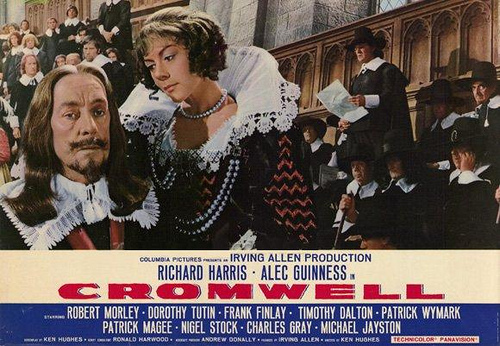 Richard Harris and Alec Guinness are both superb as Cromwell and King Charles I. Despite being on opposite ends of this debate, they both showed great respect for the other and stayed calm and collected even when they had major differences of opinion on how things should be done. They both appear regal when needing to show leadership to those under them despite everything that was happening around them. Guinness did a great job as a Monarch trying to show and exert his power despite knowing the futility of it all. He really keeps his calm throughout and shows how a monarch should act even under pressure. I loved the dialogue here because they led the characters spar between each other verbally in such great ways. The dialogue helped the action flow and it even gives us some very emotional and impassioned speeches for all of the characters. Bottom Line – Excellent historical portrait of democracy vs. monarchy which sometimes works and sometimes doesn’t. Harris and Guinness are superb pitted against one another and both remain calm and collected despite their monumental differences of opinion. Both appear regal as they try to show their leadership despite the difficulties involved. Great dialogue keeps things moving and in many scenes very emotional for all involved. Highly Recommended! This is another film I need to say. Great post. It has got me intrigued. Oh by the way. Have you decided on your topic or topics for the Joan Crawford Blogathon?? Here is the link below. how about whatever happened to Baby Jane? (1962), The Story of Esther Costello (1957) and The Bride Wore Red (1937)? All perfect choices. I was actually hoping someone would do “The Story Of Esther Costello”. I will put you down for them. Thanks for joining.